Poison in One Sentence: With a background in theatre and dance, Poison Ivory combines her thoughtful musicality with sultry and sensual movements that always leave her audience wanting more. Poison’s Act: A sultry, slow burning, classic fan dance created under the guidance of Perle Noire, ‘Let’s Burn’ sizzles with captivating stillness punctuated by moments of intense movement. TDL: I love your story about finding your voice as a performer, your journey, and how that saved you. I really identify with that; I think it’s really special and worth sharing so that perhaps in sharing, others have the courage to find their own calling. Would you mind telling us a little about your journey here? PI: Before burlesque, I was on journey of self-discovery. I ended a long term relationship, moved across the country and fell into a deep depression. Feeling allergic to everything I had ever known, I was desperate for something to bring me back to life. My best friends thought that signing me up for a few burlesque classes would be just the thing I needed to help me out of my dark hole. I instantly fell in love. In the last three years, I have dedicated everything I have to burlesque. It has not only helped me find my voice, but it gave me a new family of amazing people and fulfilled my lifelong dream of being a working artist. I still can’t believe that this is my life. I’m eternally grateful. As a veteran of the New York burlesque scene for the past three years with many festivals under your belt, what is your favourite part about being a working artist there and how would you say the working/performing life compares with other cities that you’ve visited? Do you have any major local influences that have helped shape you as a performer? There is something about the New York burlesque scene that has the ability to push a performer to be their very best, if that’s what they are striving for. I believe what sets New York apart is not only the number of performance opportunities we have, but the calibre of performers that I get to share the stage with on a regular basis. 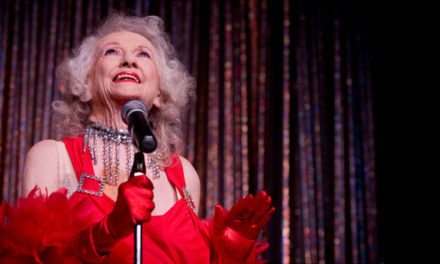 NYC is home to some of burlesque’s greatest. Being able to learn from all of them on a regular basis, both on stage and in the classroom, is what has shaped me as a performer. What sorts of must have things are on your BHoF packing list this year? Any survival guide advice for a newbie? 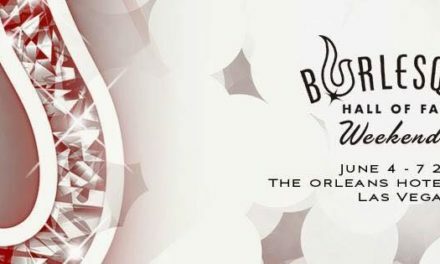 This will be my third year attending BHoF so I’m hoping that I finally figured it out. The best advice I can give is to pace yourself. There is so much happening so you don’t want to burn out too soon. I tend to be a light packer, so I don’t have much advice about fashion must-haves. The thing I am most excited about is that I’ll be renting a car this year! I love everything about BHoF, but it can get a little intense for an introvert like myself. This year I’m looking forward to getting out of the hotel and going on some day trips, as well as being able to eat all of the In & Out Burger my little heart desires. Tova in One Sentence: Blending classical lines with sensual drama and possessing a formidable strength to flexibility ratio, she is an aerial storyteller, a dream guide, a pin up girl, and provocateur. Tova’s Act: A tiny bird ‘le petit osieaux’ spins elegantly in mesmerising contortion-like poses. PI: As a woman of many talents, from ballet to aerial arts, it is clear that you are no stranger to the stage. With burlesque being a newer art form in your study, how would you compare the on stage experience of performing burlesque vs your other art forms? TDL: At this point I have observed many more burlesque acts than I have actually performed, and what I always seem to notice and appreciate, especially evident in the seasoned performers, is how well they use their facial expressions and subtle body movements to convey so many things. As a very physical performer whose prior training has taught me to take up as much of the stage as possible and focus on complex technical aspects in the studio, this is new and exciting to me, and something that I would love to incorporate more into my routines. I feel that I am surrounded by many wonderful influences here in Seattle. 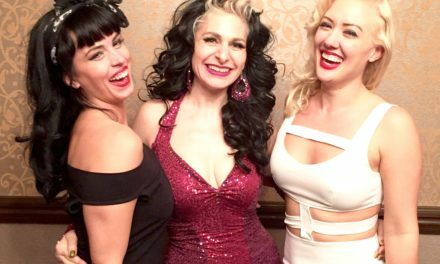 Seattle proves to be a hub of extraordinary burlesque artists who frequent the BHoF stage year after year. What is the best bit of advice given to you from your local community in preparation for your BHoF Debut? The best advice I have been given so far is from my Bombshell babe and mega seamstress Jamie Von Stratton, who has encouraged me to not stress, not overly obsess on costuming, and just go onstage and “do my thing”, have fun with it. She’s seen me onstage in many different capacities and knows it’s like my second home up there. With this being your first time attending the Burlesque Hall of Fame Weekender, besides an excellent performance, what is the number one thing you are hoping/looking forward to experiencing? I’m very excited to get on that stage, feel the energy from the sold out crowd and all the Seattle love that will be up in there, definitely. Also meeting new people from around the world, getting my work in front of an international audience, being inspired and educated by watching the other performers. Can’t wait to witness the glamour and parade of sparkles, planning all the things I will want to buy from the vendors, getting some good girl time in, and the pool! I had a dream about the pool party the other night! So I guess, just about everything! Poison Ivory and Tova de Luna will compete for Best Debut 2015 at the Burlesque Hall of Fame Weekend Tournament of Tease on Saturday 6th June in the Orleans Showroom.